Isla Vista Foot Patrol (IVFP) has recently purchased body-worn cameras for its officers, after several months of discussion that predated the recent presidential recommendation of such technology to all police departments. The department is almost ready to implement its new surveillance program, pending the integration of compatible download capabilities to its servers. According to IVFP Lieutenant Rob Plastino, the footage from the cameras could serve as more reliable evidence to present to a jury, as well as protect the integrity of IVFP by increasing transparency. “As we all know, fictions can be written, but video typically doesn’t lie,” Plastino said. Discussion on the use of these cameras began in January of last year, but IVFP did not initially have the funds to support such a project. After the riots and general violence that ensued Deltopia weekend, the discussion was reopened and became an even higher priority in the wake of the tragic mass shooting in May. “That was really the catalyst for a lot of change in Isla Vista,” Plastino said. Plastino also noted that the precedent left by the fatal shooting of Michael Brown in Ferguson, Mo. last August served as a final push in procuring funds for the body cameras. In lieu of a department program, one IVFP deputy purchased his own VidMic camera and has been wearing it on the job for a little over a year. His device, which contains both a camera and a speaker microphone, is roughly the size of a toy walkie-talkie and can be clipped to an officer’s uniform. Evidence from this pilot camera has already been used in several misdemeanor cases, such as those involving drunk in public charges. In these cases, relevant footage was sent with the traditional written police report to a jury for consideration. Once the program is fully implemented, every IVFP officer will be outfitted with either one of these VidMic models or another model from the brand BodyCam. 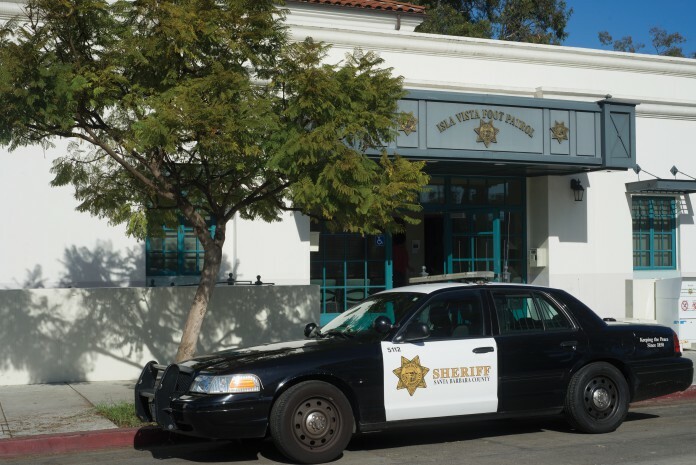 The Santa Barbara Sheriff’s Department has funded the purchase of the cameras, but plans to eventually seek out grant money for ongoing costs such as storage of the footage. One issue addressed during discussions about the cameras was the potential for an invasion of privacy should a citizen submit a public records request for a portion of the footage, which could include recordings of another citizen’s private property. Plastino said that the official policy to accompany the implementation of the cameras will state that all instances of officer contact will be recorded and that public records requests for video will be fulfilled, with the stipulation that IVFP maintain confidentiality with regard to victims and their property. Associated Students External Vice President of Local Affairs (EVPLA) Cameron Schunk feels that though the use of body cameras will not be an instant fix for police-community relations, it is certainly a step toward improving them. According to Schunk, the office of the EVPLA is also working to establish a “Police Collaborative Board,” which would offer a forum for community members to express their concerns regarding local law enforcement and make public recommendations. Legal Resource Center attorney Robin Unander supports the implementation of the cameras, provided that they are switched on for a sufficient amount of time before and after instances of citation. She said that oftentimes with dashboard cameras in patrol cars, an officer will not begin recording until the interaction is already in progress, which can be misleading. “You don’t see what led up to it; you see the aftermath, when now everything is escalating, and that doesn’t help clarify,” Unander said. Third-year psychology major Kevin Romero feels that police use of body-worn cameras might have altered an incident that occurred at his apartment last year, when a party he and his housemates had thrown was infiltrated by several undercover officers. Though the undercover operation itself was officially sanctioned, he said he felt uneasy about the way the officers conducted themselves once inside the premises. Romero, who was holding an open bottle of alcohol, recalled being grabbed roughly after a man in a hooded sweatshirt asked his age, but said that the man did not identify himself as an officer prior to touching him. “Knowing they’re cops would have made me realize ‘oh, I’m actually doing something wrong,’ but not knowing who’s grabbing me or why I’m being questioned… I could have reacted differently,” Romero said. Currently, Plastino predicts that the last technical adjustments will be finished and the cameras in use by the end of February.